Up To My Eyeballs In Varnish! 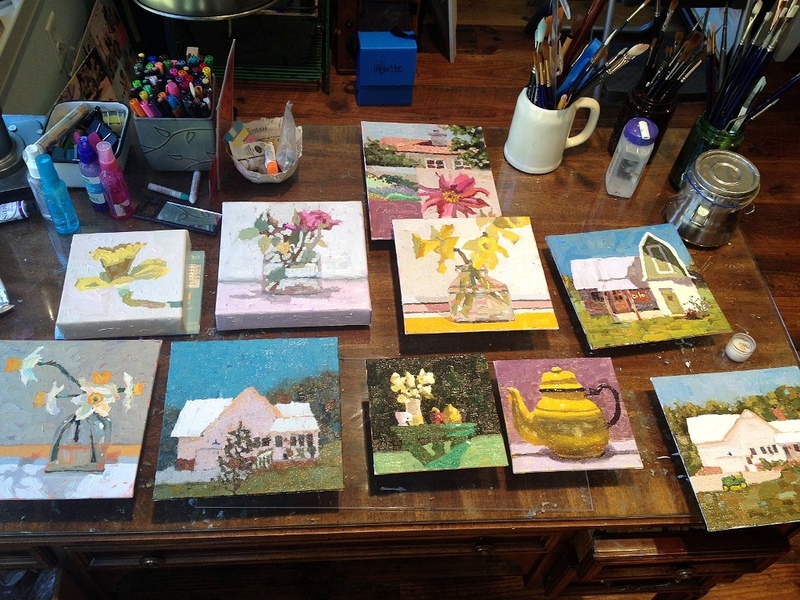 Grady and I have been working hard to get ready for the art sale and open house this coming weekend. My studio has been covered up with paintings in one form or another. 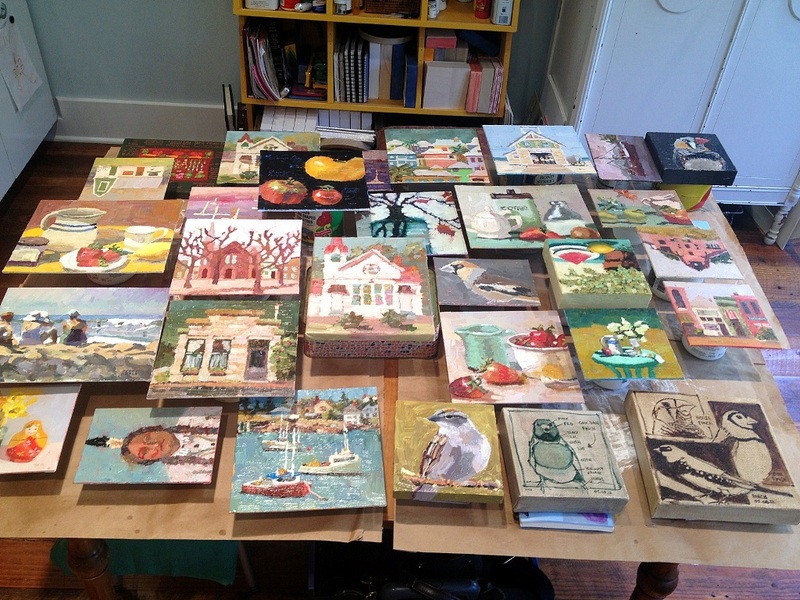 Here are two shots of two different desks covered in paintings that have been varnished. It’s going to be a beautiful Saturday so I hope to see lots of you! I meant to mention in the post about the art sale that the bird painting was done with oil bars (or also called oil sticks). I am in serious love with these things!!! It’s like painting with soft sticks of butter and they leave a nice texture to the canvas when you smoosh the bars down as you paint – I’m ALL about texture when it comes to painting! 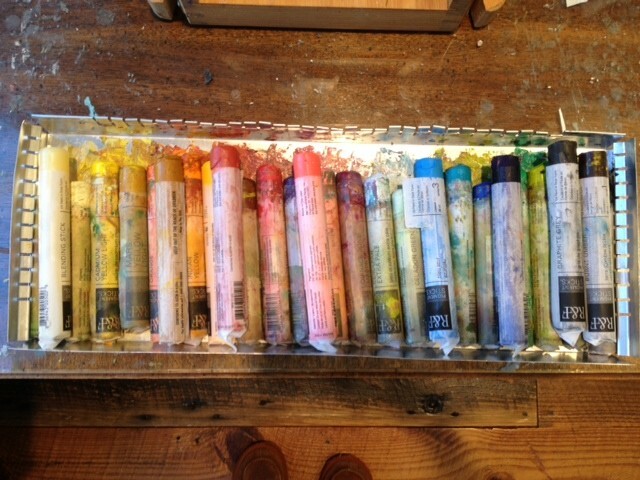 I’ll have more paintings done in these bars to show you as time goes on. They take a while to dry but you don’t have to varnish them because they are made with wax which is really nice. Below is a picture of my every growing oil bar collection. Another wonderful thing about them is that you don’t have to use turp or any mediums – just some paper towels and you’re good to go – they would be perfect for someone just starting out in oils. They also keep you loose with your painting because they’re huge so you can’t get all detail. They are FUN FUN FUN!!! !